Leading Manufacturer of 3-stage ejector system, four stage vacuum ejector and two stage ejector system from Vadodara. We are one of the leading manufacturer and suppliers of the leading manufacturer and suppliers of Three stage Ejector System. 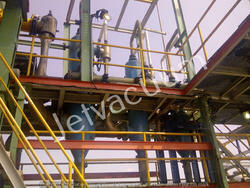 Jet Vacuum Systems Pvt. Ltd is a manufacturer of multi-Stage Steam Ejectors like Four Stage Vacuum Ejector, liquid jet ejectors, steam jet ejectors in the Country.Our Ejectors are used in large variety of application in all type of the Industries in the all type of operation like Distillation, Crystallization, Filtration, Drying, Evaporators Etc.Pressure below atmosphere is termed as a vacuum.This can be achieved by the ejector system, which works on the principle of converting the pressure energy of motivating fluid to velocity energy in order to entrain the suction fluid. Motive fluid may be low pressure OR high-pressure steam or circulating liquid at ambient temperature. We are one of the leading manufacturer and suppliers of Two Stage Ejector System with the use of high quality of raw material as per the industry requirement .